Filter based forwarding and per flow load balancing methods are quite popular. These type of load balancing can be configured in many Juniper devices like, MX series, J series, SRX series, etc. 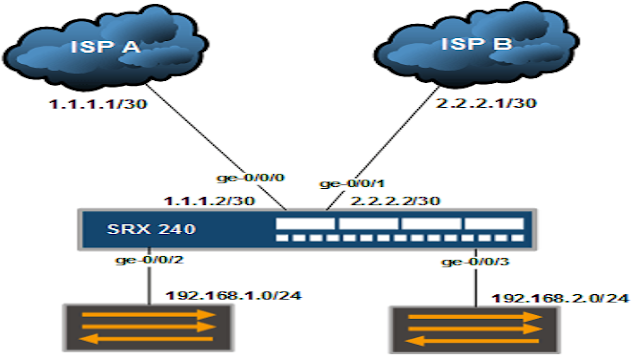 I will show you the steps to configure filter based load balancing in Juniper SRX device. In filter based forwarding, two routing tables are configured. Each table will have different ISP as their primary gateway and remaining opposite ISP as secondary gateway. We want to balance the traffic coming from internal network to the Internet using both ISP links. At first, we need to create two routing tables. Then, create firewall filter and create RIB groups. I will show the step by step process of the configuration. Below shown diagram is our scenario. We have two ISP links and two internal networks. We want to route 192.168.1.0/24 network via ISP A and ISP B will be the backup. Similarly, route 192.168.2.0/24 via ISP B and ISP A will be it’s backup. At first, let’s create some routing tables. We need to create two routing tables. Routing tables are configured under [edit routing-instances] hierarchy. We will create routing tables named ISPA and ISPB. Type show to view the configuration. Now let’s configure ISPB routing instance. Now, let’s create firewall filters. Type show to view the firewall filter. Now apply the filter in for each internal interface. RIB (Routing Information Base) group is created to share route information from master routing table to other custom routing tables. For inet family, master routing table is inet.o. As of now, routing tables ISPA and ISPB only knows the routes that have been configured while creating the routing instance. That is, the default route only. We need to copy all the routes from inet.0 to ISPA and ISPB routing tables to make the routing work properly. RIB group is configured under [edit routing-options] hierarchy. This is how you configure filter based load balancing.